But when we understand the nature of language in terms of expression, we give it a more comprehensive definition by incorporating expression, as one among many activities, into the total economy of those achievements by which man makes himself. The purpose of this paper is to exemplify, in two representative plays, the central place of linguistic expressiveness, the deployment of the verbal art as an artistic response to the written word in Soyinka’s dramaturgy. But this is without prejudice to the historic debates on the question of language usage in Africanist writings since the brilliant and often insoluble propositions of scholars like David Diop, Obi Wali and Ngugi wa Thiong’O. I will, however, indicate a caveat that I am not re-hashing the facts of earlier debates on the propriety or validity of expressing oneself in a foreign tongue. I dwell more on the validity of the perfection of a voice, rather than that of a tongue: the persistence of tonality and imagery, rather than the routine use of language as a register. In other words, the competing fact of literary and dramatic expressiveness, rather than the mere grammatical deployment of linguistic signs; the deployment of concept and its complement of graphic representation; the play between idea as a form and action as its consequence. This distinction is absolutely crucial. Language therefore is not a barrier to the profound universality of music but a cohesive dimension and clarification of that willfully independent art-form which we label music. Language reverts in religious rites to its pristine existence, eschewing the sterile limits of particularization . . . and words are taken back to their roots, to their original poetic sources when fusion was total and the movement of words was the very passage of music and the dance of images. Language is still the embryo of thought and music where myth is daily companion, for there language is constantly mythopoeic. From the viewpoint of theory, it has always been clear that Soyinka’s forte and the fundamentals of his artistic creation incline largely towards the deployment of language as trope and as virtual activity. He affirms that language is ‘the embryo of thought and music” and that language is “constantly mythopoeic.” This means that, to a large extent, the genetic basis of his art depended on the cloning and manipulation of words, linguistic smithing, semantic interpolations, configuration of terms and terminologies, and the extraction of meanings from words and being. 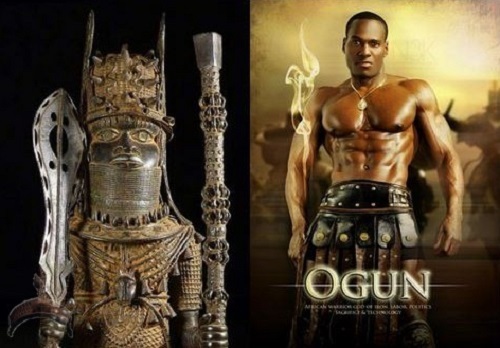 This playwright’s re-interpretations of classical and Yoruba mythology is well known and attests to the fact that he is aware of both the primordial as well as the modernist poetic potentials of the mythic lore available on the African continent. This, in turn, de-limits the elastic boundaries of the various genres and sub-genres which he adopts from time to time in his narratives and story-making. It can also be said that it is this attitude to the limitless potentials of language and its tropes that account for the cryptic and the elliptical nature of Soyinka’s writings. He, thus, simultaneously creates a major engagement for exegetes and interpreters who have to be preoccupied with cultural hermeneutics and structuralist poetics. One is tempted to say that this playwright believes that language is an organic entity which grows in and of itself. For him, language, thus, constitutes a world in which the poet, thinker and artist regales himself. Society is, consequently, inter-mediated by a poet’s understanding of its expressive tendencies and its pre-disposition to act or celebrate both its achievements and its own foibles. Language is—language, speech. Language speaks. If we let ourselves fall into the abyss denoted by this sentence, we do not go tumbling into emptiness. We fall upwards to a height. Its loftiness opens up a depth. The two span a realm in which we would like to become at home, so as to find a residence, a dwelling place for the life of man. From the foregoing, it is easier for me to lunge into the discussion of Madmen and Specialists (1971) and The Road (1965). I have deliberately reversed the chronological order of publication. The two plays, by the way, appear as convoluted “domestic” or domesticated animist, existentialist dramas orchestrated by a cultus or a sect. In both, in accordance with our introduction, speeches appear as parables, tropes or symbols for things unrealized and only partly expressed or expressible. We are, therefore, even more challenged by things unseen than things which are normatively present. They appear as synecdochic dramas of existence; a part often representing a complex, imaginary whole. Again, both dramas evoke the semblance of a homestead by the roadside or near a market place, clearly discernible by denizens of the downtown city centre—mendicants, the destitute, vagrants and dispossessed; purveyors of commerce and crass employees of commuters, transporters and dreamers. Let us examine Madmen and Specialists first. In this play, our sensibility is challenged by the contrast between a clinic/surgery and the activities of roadside beggars and urban destitute. A portraiture of the same kind of contrastive ambience can be found in Ousmane Sembene’s celebrated work Xala, even though the stylistic portraiture and sensibility of both artists are radically different. The beggars are objectified in Soyinka’s play, whilst they are consciously subjectified in Sembene’s work. In the former, they appear almost as a means towards an existentialist end, whilst, in the latter, they constitute a materialist end in themselves. Let us now turn to the interplay of words and ideas in the dramaturgical references of the playwright, the mythopoet. One of the physically impaired characters in Madmen and Specialists, Goyi, surmises that, since the streets are deserted and their fortunes as beggars are not forthcoming, there is some ominous event. Beyond this, however, he ascribes the haunch to the metal contraption used to prop up his spinal column. 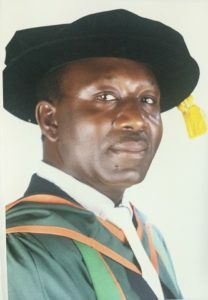 In Soyinka’s mythography, even that processed therapeutic steel has the inkling of its god and salutary referent, Ogun. Hear Goyi, a self-acclaimed devotee of the iron deity: “Something is driving them away from here. If there isn’t something going on, then this isn’t an iron I have in my back” (219; my emphasis). Here is an instant reference to a sixth sense; a haunch which is only partially inferred rather than fore-grounded or reified. 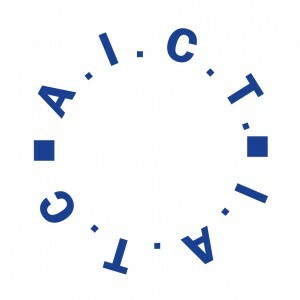 This trope advances itself in the dialogue of the mendicants who seem to pass time, in an absurdist sense, by cryptic allusions which help us to fathom that, in their analyses of the major characters in the play, they, like the Greek chorus try, without success, to distinguish between profession and doctrine; between an alchemist and a scientist; as well as between a traditional healer and a witch or sorcerer. Their moral or sociological status is often blurred, but we realize that they are also used to gather intelligence and extract information for the secret service of government through a double-faced technocrat, Dr. Bero. These denizens are party to the new philosophy of Bero and to his homicidal tendencies. In spite of the fact that the mendicants and Dr. Bero superficially belong to the same fraternity and can communicate in a jargon of the underworld, there is always a constant status-related tension. This is borne out in the sober, reflective phrase of the blind man that: “When things go wrong it’s the lowest who get it first” (222). swine. Vendetta my foot. I tell you the cripple has. . . .
Official secrets that’s what is at the bottom of it. Without a doubt, the problem of graft and prebendalism, which is the bane of the emergent post-colony, is often topical debate here, in this dark play, as much as it is in better lit corridors elsewhere. Whilst it is analytically clear to the elite and the middle classes, they are often helpless in the practical eradication of the problem. Praxis and political control are often real issues in the socio-economic management of postcolonial states. The silent, the dumb, tell tales and gossips in the ranks of these beggars, and, by extension, the underdogs support the kind of irruption which Bero undertakes against his father who uses language to liberate the doubly oppressed. Colonial alienation takes two interlinked forms: an active (of passive) distancing of oneself from the reality around; and an active (or passive) identification with that which is most external to one’s environment. It starts with a deliberate dissociation of the language of conceptualization, of thinking . . . from the language of daily interaction in the home and in the community. It is like separating the mind from the body in that they are occupying two unrelated linguistic spheres in the same person. On a larger social scale it is like producing a society of bodiless heads and headless bodies. This is analogous to what Frantz Fanon describes as the victims of alienation, uprooted and floating—a race of angels without national or cultural affiliations. Bero’s argument about helping battered persons to think follows from the logic of alienation and tortured identities. 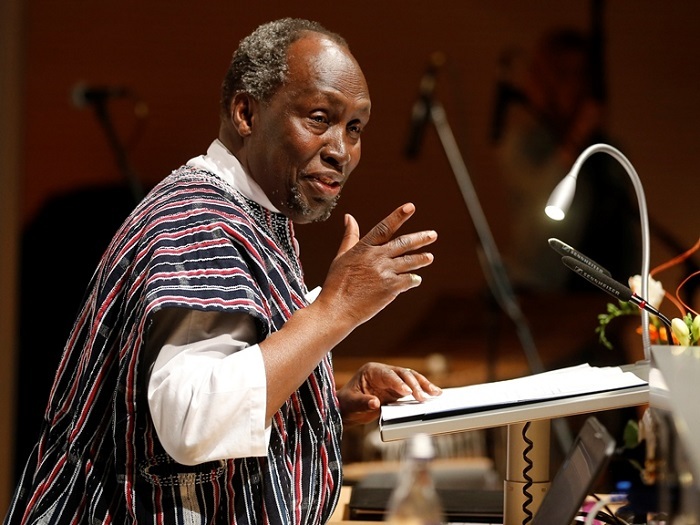 This accusation, for which he would later sentence his father to death, was the same accusation that a postcolonial state leveled against Ngugi wa Thiong’O: that he had been teaching or conscientizing less privileged peasants to be politically aware at the Kamiriithu Community Educational and Cultural Centre! This account he has given in his prison notes. The recurrent factor was that the mind or head was being better equipped to propel its body against conditions that had dehumanized and de-historisized it. Here, the question of language and logical thought become a reversionary colonial project which appears in Soyinka’s play both as a “theatre” within a theatre as well as a surgical theatre, in which the old man seeks to dissect the cripple – a veritable, scientific victim of the postcolonial state. Earlier on (223, 230), Soyinka puns on linguistic tropes to express harsh, irreverent referents, such as when he refers to the mangled physiology of Goyi as capable of producing a crooked progeny and to the blind beggar as a blind advocate, but, towards the play’s denouement, the characters’ cant are sharper, more direct, and appear as ominous parables in the context of the grim polity— notorious for its blatant disregard of all communal values and mores. This is largely due to the social and psychological collapse of all ethics and morality generating cohesion in society. This, in itself, presents another dimension to a conceptual order of language meant for the rejuvenation of society’s moral fabric. 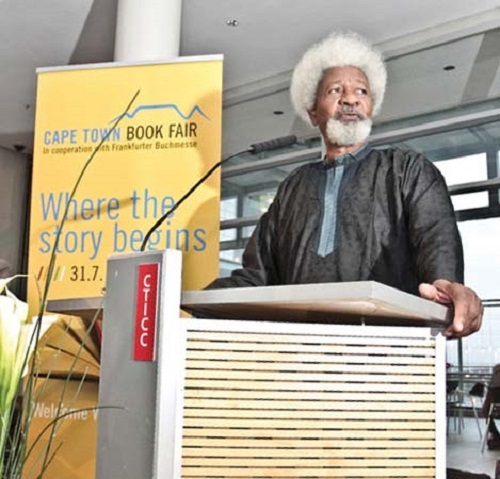 Soyinka himself remarked the purpose of his elliptical writing style in his interview with John Agetua. When the author or critic is completely frustrated and repulsed of his/her entire surrounding, hitherto taken over by decadence, ineptitude and moral corruption, he converts his vocabulary into a weapon which compels attention and redress. The whole of the second part of the play is couched in the parable of a nursery rhyme where each alphabet finds its doomed equivalent in a universe that is shadowy and paranoid. Tropes are invented by contrasting orality with writing where the latter is the dominant mode. Reading is also contrasted with writing and vision; and power is matched with authority (251-52). This is the point where the existentialist philosophy of AS, the unwritten, inexpressible dictum of despondency and irrationality get the better of its victims. Their world careers inexorably down a hill over which they are totally helpless. In such a desperate situation, where action or inaction lead to the same disastrous result, fatalism and absurdism are movements ready at hand for application. This is similar to the world enunciated in artists like Beckett, Kafka, Ionesco and Camus. The more humanity seeks to control the world before him, the more he loses the grip of it and gravitates towards its destruction. It is at this point that the search for the meaning of the formulaic dictum, AS, begins. On one page alone, Bero asks the question seven times, “Why AS?” of his father who had converted him to cannibalism. To this there appears to be no answer (253), and the interrogation continues undeterred. Your faces, gentlemen, your faces. You should see your faces. And your mouths are hanging open. You are drooling but I am not exactly sure why. Is there really much difference? All intelligent animals kill only for food, you know, and you are intelligent animals. Eat—eat—eat—eat—eat—Eat! Aafaa: . . . I am a good pupil. The Old Man himself admits it. The quickest of the underdogs, he always said. This detailed confession came soon after a meal of human flesh—the irreverent feast of homophagy where, as the saying goes, a dog has eaten its own kind. He affirms that he is helpless and that the post-colonial project has no reverse gear. But, the greater complication, perhaps wit, is the fact that the playwright draws a brilliant conceit from the loss of freedom and the travesty of a religious, even secular, rite. Aafaa claims he has become a victim of this strange amnesia in the process of conferring others with it. Soyinka deploys fantastic puns in his merciless fragmentation of language, and it would appear that he rightly represents the attenuation of consciousness with the cerebral disconnect between language, thought and one’s immediate environment. The post-colonial project is a fragmented nursery rhyme whether it be on the battle fields or in the classrooms, clinics or homesteads. The conundrums that these denizens express appear like a “creed turned heresy,” but the remission of a self-inflicted violence in the ranks of these ill-fated denizens will not cease until the cycle of their existential stupidity is demystified. Minds need to be purged, re-processed and liberated from the delusions of slavery, dehumanization and self denigration. Unfortunately, this play does not grant such a privilege. The post-colonial crises is, thus, a closed predicament. Smoke-screen. That’s what it all is. 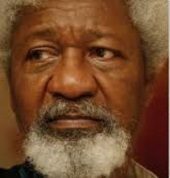 Soyinka presents a closed predicament in that the post colonial, post-independence elite is forced to deploy wit and language in an irresponsible, insensitive and insincere manner. In the speech by the character earlier referred to as a blind advocate, there are eclectic and cryptic allusions to the Congolese crises of 1960; the demagogic speeches of African leaders at independence rallies and the typical demagoguery which often accompany phony election victories. Oyin Ogunba, in his well known book, The Movement of Transition, has mapped out a geometrical conceptualization of the stage in this play. Whilst I accept Ogunba’s delineation to be succinct, I wish to further add that the play can be conceptualized as worlds or historical epochs whereby the two ancient women, Iya Agba and Iya Mate, represent the ante-diluvian world cryptically referred to in the play, or an era of the pre-colony. The old man, his son Bero and the merchants represent the post-colony, whilst the formidable womanist, Si Bero, represents the fragile link between the tripartite epochs. The post-colonial debacle here does not give room for hopeful indications of the immediate future; unless, of course, there is a total dismantling of the AS system as portrayed. This is what I have termed “a closed predicament.” In drawing an existential parallel, I find a close affinity between Madmen and Specialists and Samuel Beckett’s Endgame. In Beckett’s play, post second world war Europe—as in Soyinka’s play—was a wasteland where the fate of man was as unpredictable as the outcome of war itself. Game and morbid sport was also a dramaturgic tool in that context as it is here. What is inexpressible in everyday language has been coded as a performative event: a ritual passage which helps man to experience his past and his future in the present phase. The elements of ritual, whether they are Egungun pantomime or priestly service, belong to an entirely symbolic language, that of Yoruba religion. They cannot be transposed into a written play, and performed on demand, before a public whose members do not belong to the particular society. 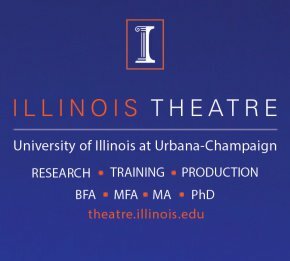 In other words, modern theatre translates into universal language these particular elements. Their translation is obviously a betrayal, but this betrayal can be creative. This is where the concept of re-interpretation in cultural anthropology can be linked with that of creative treason developed by Robert Escarpit. In the use of language to represent the inexpressible, Soyinka often resorts to the dramatization of speech, the spoken word, the dramatization of the source of Language as lingua. It is also true that for the artist to achieve some level of aesthetic distance, he has to transpose symbolic images between himself and his narration, as an artistic lingo. If he fails, he would be talkative and would intrude constantly in his own artistic narration. This could make the play unduly wordy and demagogic. Precisely to avoid this danger in a medium that is not prose-fiction, the bivalent manipulation of “the mask” and “the road” is of supreme importance. 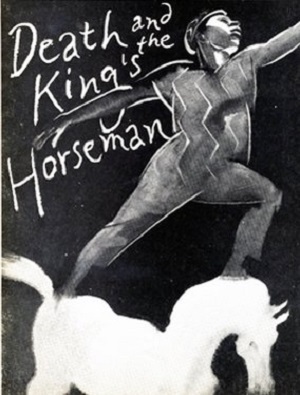 Apart from his lyrical dance drama, Death and the King’s Horseman (1976), it is in The Road (1965) that the image of “a journey of transition” is most exemplified. The physical road tells us that we are on a journey to nowhere, whilst the mask reveals that we are on a conceptual journey to a place where time recedes but does not end. The beginning is in the end and the end in the beginning; we, the reader or audience, must patiently wait for dramatic thought to project dramatic action and the revelation of its realization and renewal. There can be no truer representation of this fact than the characterization of Murano and Professor in the play. In the worlds of the author, they serve as an arrest of time; in the lethargy referred to by Nietzsche, they, like the lonely road, “Lay in wait.” In all of Soyinka’s portraiture and characterization, there are no dramatic figures quite close in delineation to a god as those of Professor and Murano. In the evocation of an artist, he falls in love and admiration for these two dramatic personae. The complexity and depth of a character comes through when there is palpable tension between his thought, word and deed (or action). For Murano, he sits, almost like a statue in a corner close to the web of a spider; he fetches the communion palm wine so dutifully and interminably, but is short of the expression of what he sees and knows. He typifies the idiomatic expression: “not seen, not heard, nor to be uttered.” Meanwhile, Samson and Salubi banter away and weary the time on tripe and trifles. As for Professor, I will give him special office with air-conditioner, automatic printing press and so on and so forth, so he can forge driving licenses for all my drivers. The man is an artist, and as a millionaire, I must support culture. (154; my emphasis). If, with the benefit of hindsight, we examine the logic of the dialogue (the dialogic logic, with all due apologies to Mikhail Bakhtin) in Madmen and Specialists, this is another instance of the license of the “Philosophy of AS,” propagated by the denizens of that uncanny play. Professor (much like the Old Man in Madmen), an otherwise mundane figure, presides over an empire where the dead finds solace in their daily commune with the living. He is to lead his miserable minnows to navigate the understanding of a philosophy much above their ken. He is, of course, a man of the future much intoxicated by peculiar, incidental learning. They hold him in high esteem and trust that he will always be there as a batty, unrelenting godfather and are willing to obey him. He is, thus, one sure source of solace. He is also the leader of the commune and the keeper of the sacred word. Their world is thus bi-focal in the sense in which the Church and the Shrine have become contiguous institutions in the play. The sacred and the profane, thus, have a subtle interplay. By way of conclusion, it is necessary to ask again whether, in the mood of these two plays, the postcolonial situation is not a closed predicament. In both plays, there is a sense of cynicism which is bone deep and pronounced. Even jokes and banters are laced with ingenious and potent doses of cynicism. At no time do the characters master their world as determinant subjects. They all appear to be objects and victims of their own circumstances. They are not seen to move on, neither are they dynamic as citizens in their own rights. They all operate under a localized, mythopoeic spell. Are they thereby resigned to fate? It might be argued that Madmen and Specialists is occasioned by the physical deprivation and the disillusionment which the author suffered on account of extended solitary incarceration and the desolation of the war around him, where his artistic genius did not leave any ray of light or hope at the end of the imaginative tunnel. The representative citizens made up of handicapped, abused and castaways did not think of themselves within the scope of redemption. The fact that the so-called redemptive agents typified in Dr. Bero now turn around to prey on the social fabric to the extremes of cannibalism nullifies the hope for redemption and renewal. Worse still, the traditional forms of restoration as exemplified in the old women were also targets for infernal destruction such that new life were not given the chance to sprout after them. By the way, Soyinka, in exemplary sensitivity, was careful not to represent the old order as altogether perfect or beneficial. The vision was consistent with that in The Road, which had been written six years earlier. Even if we moved back in time to include the play written for performance at Nigeria’s independent celebration, the vision of it was equally dark. It shows that there is a consistency of vision in Soyinka’s postcolonial observation of the new nation called Nigeria. The artist had his doubts and projected it on his tapestry over a period of one decade, thereby substantiating his vision that the nation may turn out to be a dysfunctional half child. At least, A Dance of the Forests was that bold in its speculation on the fate of the new nation, Nigeria. The Road has both a local as well as a broad application in that West Africa’s mammy wagons and truck drivers remain as true as they were at the time of the play’s conception. Fifty years is a long time in the life of a nation and cannot be taken for granted or wished away. This is why it is germane and as relevant as ever to ask whether the postcolonial question is not a closed predicament. Another fifty years down the road, we may be most rarely privileged if it is possible to ask the same question once all over again and these plays re-enacted. 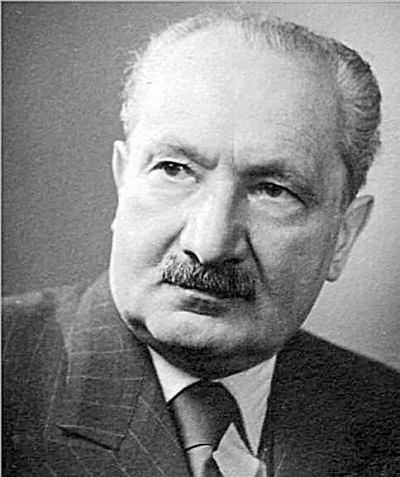 Martin Heidegger, Poetry, Language, Thought, trans. Albert Hofstadter, New York: Harper & Row, 1971, p. 192. David Diop, “Contribution to the Debate on National Poetry,” Presence Africaine 6, 1956. Obi Wali, “The Dead End of African Literature,” Transition 10, 1963. Ngugi wa Thang’o, Decolonising the Mind: The Politics of Language in African Literature, London: James Currey, 1981. Robert W. July, “The Artist’s Credo: The Political Philosophy of Wole Soyinka,” Journal of Modern African Studies 19.3 (1983) 477-98 (418). Biodun Jeyifo, Wole Soyinka: Politics, Poetics and Postcolonialism, Cambridge: Cambridge UP, 2004, p. 39. Wole Soyinka, Myth, Literature and the African World, Cambridge: Cambridge UP, 1976, p. 147. 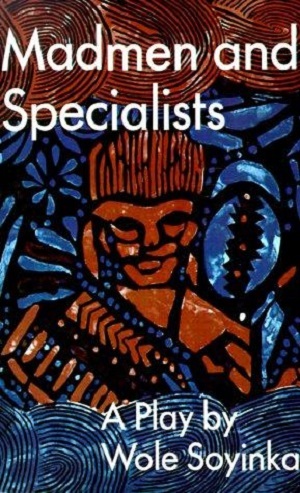 Wole Soyinka, Madmen and Specialists in Collected Plays 2, Oxford: Oxford up, 1974, pp 215-76. Ousmane Sembene, Xala, London: Heinemann, 1976. Ngugi wa Thong’o, Decolonizing the Mind: The Politics of Language in African Literature, London: James Currey, 1981, p. 28. 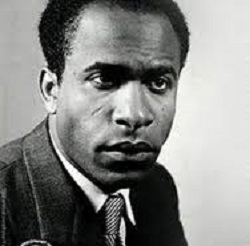 Frantz Fanon, The Wretched of the Earth, Harmondsworth: Penguin, 1978. Ngugi wa Thong’O, Detained: A Writer’s Prison Diary, London: Heinemann, 1981. John Agetua, When the Man Died: Interview with Wole Soyinka, Benin: Privately Published, 1974. Oyin Ogunba, The Movement of Transition: A Study of the Plays of Wole Soyinka, Ibadan: Ibadan UP, 1978. In part, I have derived this concept from an earlier use by two scholars outside the field of literary criticism—Robin Horton, an anthropologist and David Okpako, a pharmacologist. Samuel Beckett, Endgame in The Collected Works of Samuel Beckett, Grove Press, 1970. 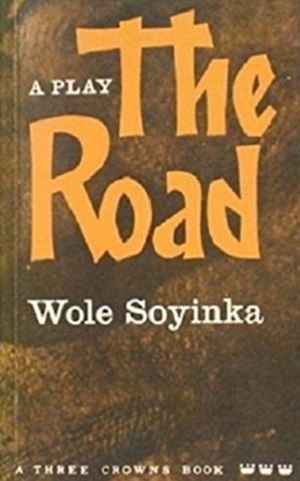 Wole Soyinka, The Road in Collected Plays 1, Oxford: Oxford UP, 1982, pp 147-232. Alain Ricard, Theatre and Nationalism: Wole Soyinka and LeRoi Jones, trans. Femi Osofisan, Ile-Ife: Ife UP, 1983. Friedrich Nietzsche, The Birth of Tragedy, vol. 2, trans. Wm. A. Hausmann, New York: Gordon Press, 1974. 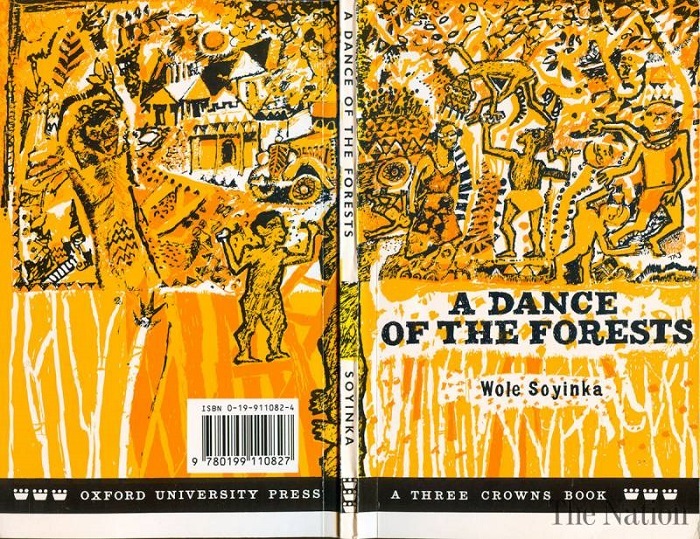 Wole Soyinka, A Dance of the Forests, Oxford: Oxford UP, 1963. *Oladele Olatunde Layiwola is a two-time Director of African Studies at the University of Ibadan, in Nigeria, and a former Director of the University Media Centre. He obtained an honors degree in English from the University of Ife (now Obafemi Awolowo University), Nigeria, in 1981, and won a Commonwealth Scholarship to study for a Ph.D. in Theatre Studies, at the School of English, University of Leeds, UK, from 1983 to 1986. 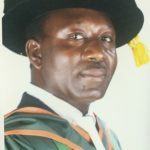 He has served on most major committees of Senate and on the Governing Council of the University (2003-2007), among many other high ranking positions. He is a life patron of the Boys and Girls Brigade and a life Patron of the Nigerian Red Cross. He has published in a number of local international journals (Journal of Dramatic Theory and Criticism; New Hibernia Review; Ufahamu; Asian and African Studies; West African Journal of Archaeology among others). His most recent publication is an edited work on Ibadan titled: The City-State of Ibadan: Texts and Contexts (Bookbuilders, 2015). In 2012, Professor Layiwola was elected to the Fellowship of the Nigerian Academy of Letters (NAL), the apex academy for the humanities in Nigeria, and had also served as the General Secretary of that Academy from 2012 to 2014.